Mammoth Locomotive Works has been involved with the live steam hobby for well over three decades and has been a major force in large-scale live steam. Our product line includes everything from large-scale locomotives to trucks and accessories to boilers. The brand is a well-established one associated with exceptional quality and compliant construction. Whether you choose a coal-fired locomotive with its evocative smell or a locomotive based on one of the new green fuel technologies, we can help you create your railroad and keep it running well. Our consultative services range from onsite general operational evaluations to part-specific (e.g., boiler) evaluations. We can provide detailed written reports on our findings and will interact with any government agencies that may have oversight for your operation. We provide concept to completion services for locomotive construction with onsite delivery and installation available. 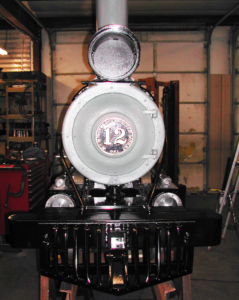 From your concept, we can design all aspects of the locomotive project--including the boiler. We can construct--or oversee construction--of your project through to delivery and setup. We offer onsite consultative services, FRA boiler inspections and project development services. The Company holds an ASME S stamp. This beautiful live-steam locomotive, constructed by Mammoth Locomotive Works, is reminiscent of centuries past when the world seemed less complex even if the hundreds of parts in the locomotive were a little more difficult to understand. Our working knowledge of live-steam locomotives is extensive: We construct amusement-park size locomotives and consult on every aspect of their operation as well.